The Ketubah (Kesubah) is not only an important document but also a symbol of your marriage. Throughout the centuries, the Ketubah has been personalized by the couple and artfully decorated. Contemporary Ketubot may use a variety of styles and printing techniques as well as calligraphy, photo images, and papercuts. We are the world's largest yarmulka store. We manufacture all kinds of kippahs right here in our factory where we stamp them for your event. Our yarmulkes and kippots bear the distinctive stamp of quality, and a half-century of experience and expertise. 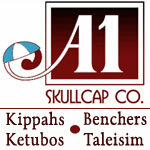 At A1 Skullcap, we also carry large selection of benchers, Weinreb Ketubahs, and Taleisim to complete your wedding needs. Coordinated Ketubah, Invitation and Bencher Collections. Inspired by the colors, textures, ancient stones, terraced slopes and native olive trees of Eretz Yisrael. Contact me for a price quote and to create your custom wedding collection. 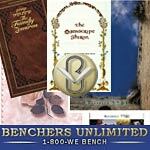 Your one-stop source for Benchers, exquisite Ketubos, Kippot, Taleisim, and your other Judaica needs. We carry everything your chosson or kallah may want or need - Jewelry, Silver Gifts, Linen and Bedding, Antique Leather Sets, Chosson Shas, Tallis bags, Tallesim, Ataros, Benchers, Shtenders & much more� unbeatable prices on Chosson and Kallah packages! 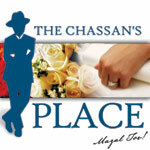 So come and make your shopping a pleasurable experience, at TheChassan'sPlace.com - The full Simcha source - right in your home! 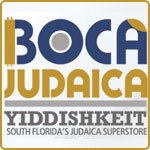 Torah Treasures is located in scenic midtown Miami Beach. We sell Judaica, religious items and books in English, Hebrew and other languages. We pride ourselves on our knowledgeable staff and our vast selection of items. Aspaclaria - the largest Judaica store in the southeast - will help you with all your wedding Judaica needs: yarmulkes, ketubah, tallis, or any gifts. With an extensive selection of ketubah designs, texts and price points, you will be sure to find your perfect ketubah. The warm personal service of the knowledgeable staff will guide you every step of the way. We offer an incredible selection of Judaic items from the inexpensive to fine handcrafted giftware including awesome mezuzot - chanukiot - kiddush cups - seder trays - challah trays - tallitot - music - books and ketubot. Find the perfect gift for any occasion including weddings and bar or bat mitzvahs.